My grandparents were mostly self-sufficient on a small two-acre farm. They had a milk cow, raised a beef cow each year, had chickens, pigs, and a large garden. They traded for many items, sold some produce, and purchased a little coffee, sugar and a few other needed items. They worked hard and had very few luxuries, but they could live on what their land produced. Traditional wisdom says that you need two to five acres for self-sufficiency. This was the limit in my grandfather’s day, and it’s the rule he taught me. However, farming methods have changed a lot since I was a child on my grandfather’s farm. Using hydroponics, vertical growing, and other intensive farming methods, is it possible to be self-sufficient on less land? Could you produce all your own food on a small plot in the city? It is certainly possible to be self-sufficient on less than two acres of land. Much depends on your location and climate. If you have good, fertile soil, then you are half-way there already. If your land is hard, rocky clay, like my ranchette in Texas was, then you are going to have to learn a few skills. However, modern technology and food production systems can work on any soil, anywhere. You just need to find the best system for your situation. Here are a few examples of ways to increase productivity and reduce your land requirements. If you can barter some of your vegetables or meats for the grain you need, or trade eggs for apples, you can save the amount of space you would need for your own apple tree or for growing corn, rice, and wheat. Get to know the other farmers in your area, and establish a barter system where each contributes his specialty. In most areas you are only able to grow during part of the year. However, succession planting of cold weather plants behind warm weather plants helps, and a heated greenhouse can greatly extend your growing season. If you can grow year round you will only need half as much space, so investigate these methods and determine what is possible in your area. Using raised bed gardening you can micro-manage the soil in each bed, providing the nutrients each plant type needs and the best pH for growing that plant. When plants get what they need, they grow better and produce more. The plants are more densely packed in the bed than in a traditional row, also conserving space. Using edible landscaping in the front yard and raised bed gardening in the backyard, The Urban Homestead grows 6,000 to 7,000 pounds of produce each year using only natural fertilizers. They sell their excess vegetables for a profit of over $65,000 annually and use the cash to purchase rice, wheat, sugar and other staples. The Urban Homestead also produces over 2,000 eggs annually and 25 to 50 pounds of honey. They do all this on a 1/10-acre city lot. Founded by Dennis McClung, Garden Pool started as an experiment in self-sufficiency and has grown into a charitable organization that builds and teaches the garden pool concept in poor communities around the world. 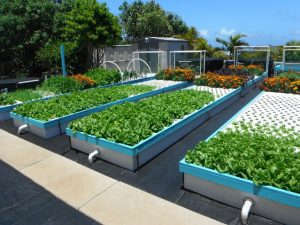 The sustainable food system is centered around an in-ground pool with a greenhouse built over it. The entire structure encompasses 480 square feet and sustains poultry, tilapia, fruit, vegetables, and herbs grown through hydroponics and aquaponics. The garden feeds a family of four with eight eggs daily and an unlimited supply of fish. The family trades excess fish for other meats. There are videos about the garden pool concept. A traditional garden bed requires almost half an acre per person to provide all the fruits, vegetables, and grains needed for an entire year. Each plant requires its own space; it competes for nutrients with its neighbors and will produce less if crowded. However, it is possible to get good results from crowded plants in a hydroponic system. Another way to grow large quantities of vegetables and fruits in a small space is with vertical hydroponic gardening. Vertical gardening multiplies the amount of growing space available while taking up very little room in your garden or on your patio. The hydroponics system makes sure each plant gets all of its required nutrients in a small footprint. By using a vertical organic hydroponics system, you can grow all of your fruits and vegetables in much less space. Vertical grow systems are available for purchase, or you can build your own if you have the knowledge. You can place the systems anywhere that you have sunlight. In the southern US, I’ve seen many vertical hydroponic systems placed in backyards and on patios. In New York, they are catching on as roof-top gardens to supply upscale restaurants with vegetables. Before deciding how much land you will need, keep track of your consumption. How many pounds of tomatoes, squash, beans, etc. does your family eat each year? If you have the time, weigh and keep track of your intake for a full year. You can get an estimate using a week or a month, but keep in mind that eating patterns are different in the summer and winter. Once you know your annual needs, research farming methods and yields in your area. How much can you expect to grow in the native soil? What about using hydroponics, vertical gardening, aquaponics, or other intensive growing systems? Start slowly with these methods; there is a learning curve. To be self-sufficient you not only need land, but also good soil or other growing media, an agreeable climate or greenhouse, and a sustainable and steady water supply. If you are dependent on rainwater, you need to store enough to nourish your plants between rain storms. You also need the skill to preserve your harvest. If you are planning to use traditional growing methods, you will need at least two acres to sustain a small family. If your family is larger, or if your soil or climate is poor, allow five acres or more. It is certainly possible to be self-sustaining on less land, though. I’ve given you two examples of families growing all their own food on a small lot, and you probably know of more. Using alternative growing methods, you can greatly increase your yields. However, these methods have a learning curve, so don’t plan to jump right in if you don’t have the required knowledge and skills. Like most things in life, farming requires practice and patience at every level. One of the items your grandparents clearly traded for was hay. You can raise a milk cow and a beef cow on 2 acres along with pigs/chickens/garden. I raise couple cows/2 pigs/yr/chickens and garden extensively, (including 3 season greenhouse) in a decent rainfall climate, on 4-5ac, and no way can I grow enough hay/grains to feed my critters all year long…..just can’t be done. you CAN NOT raise all those critters on 2 ac without having to buy hay at least, and probably grains. I was thinking about that, Andy. Traditional wisdom says that you need about 4-5 acres per cow. On a couple of acres to keep that cow going over the winter you would HAVE to trade for hay. Good point. Some areas of Texas require 13 acres of graze for a cow if you are also feeding them grain or supplements. meant if you are NOT also feeding them grain or supplements. IN ADDITION IN NORTHERN OHIO YOU ALSO NEED MINIMUM SIX ACRES OF WOODS FOR HEAT – PREFER TEN ACRES TO HARVEST FOR SQUAW WOOD WITHOUT FELLING TREES – JUST PICK UP FALLING TREES.. HORSES AND COWS NEED ABOUT 5 ACRES PER TWO ANIMALS – SO I WENT FROM 5 TO 40 ACRES OVER A 40 YEAR PERIOD AND HAVE NO REGRETS. If you plan to cut all your own fuel you’ll definitely need a few acres of timber – and the more acres you have, the more sustainable it’s going to be. This article is focused on food though. Really, what I like about it most is that it shows a few ways someone in an urban area can make up for their lack of land. While I agree that you would need quite a bit of wood for heating. People should be aware that you don’t need as much for cooking if you build yourself a very efficient method of cooking. Example a rocket stove. I live in 1/3 acre in the middle of town, but in the old times here, property lines were marked by trees. In other words, I have ten hundred year old trees that drop wood constantly. So even if you can’t afford to buy acres, you can still get some of the benefits, without even having to cut down trees. Older trees can be a real asset. I must have missed something..you are still dependent on outside world for hydroponics..ie thing must be bought things brake ect…only and I mean only way is ten acres per person..as a hunter gather..or else you are using the outside world..
Reducing your reliance on the outside world is always worth doing, even if you don’t completely eliminate it. Setting up a hydroponics garden means buying some supplies, but once it’s up and running you won’t have to buy as much food. It’s not total self-sufficiency, maybe, but it’s MORE self-sufficiency. I specifically relocated to southeast mountains where climate still offers four seasons with less severity. I plan to produce poultry meat/eggs, fruits, berries and vegetables leaving me need for tea/coffee, grains which I could barter for. As a Master Gardener, I have invested heavily in gardens/orchards/poultry set up as my main focus is to establish a small homestead where I can be 75%-90% self sufficient. Purchased a freeze dryer, solar generator w/600W of panels, brought with me 6 mature blueberries, 6 gooseberries as well as planted 18 asst fruit trees, 4 more blueberries, haskaps, blackberries, raspberries, June and Everbearing strawberries and table grapes. Installed 275 sq ft raised beds, 32 ft pea/bean/cucumber trellis, hybrid hydroponic for lettuce and 12-20gal containers for potatoes. I cultivate Heritage veggies and already save seeds. If push came to shove, I could finish a small hog and plant some grain/alfalfa/cover crops for feed. I have little over one acre but so far am only utilizing just under 1/2 acre. With proper planning, placement and structures, you can homestead poultry/veggies/fruits/berries and get really close to self- sufficiency. That requires some research and investment of $$$ in the set up however. Yes you can hit 75-90% with fruits/veggies. We do. Meat is simply a different story…….try to raise much of it, and you’ll be ‘importing’ hay/grain from off your place.Must have a minimum of 1 ac per cow (for example) plus 3-4 acres to cut hay off, and ideally another acre or so for grain if you plan to feed grain. We also live in the SE (East TN)….rainfall is mid-40″ range per year. We use about 5-6 ac of our 70ac wooded mountain side for pasture/gardens/orchard, the rest is wood lot. I raise a weaned steer to 2 years of age prior to slaughter. We will use one beef per 15-18months, 2 folks in the family now. Takes around 15 tons of hay and 4 tons of grain per year to supplement my pasturing 3-4 cattle. We raise two feeder pigs per year for the freezer, from 30lb weaned to 275-350lb finish. Last year, for example, it took 36 bags of feed (18% 16% 14%), or 1800lbs, to raise two to 325lb each. They have access to good pasture (I resow it in fescue/clover each year), and all the garden scraps. We raise 20-25 Cornish X for meat each year (keep 20-30 other layers also). Last yr, it was 21. Took 450lbs of feed from day old chicks to 6-7lb finished birds, plus moved on fresh grass every day (chicken tractors)(THAT right there takes 100sqft/day….2 tractors 5’x10′ times 4-5wks…around 1/2ac) Prior year 27 took 700lbs feed. Been doing this a long time, and keep pretty good records. While you can get a FAR better food than you can buy in a store, you will have a hard time competing on price, and you certainly will have to depend on outside sources for many items. My thinking was to maybe purchase either a half or whole hog form a local farmer and share cost half/half with a neighbor. My intent is really not to have cattle. Cup of strawberries has more Vitamin C than a medium orange. Bell peppers, broccoli, kale are also excellent sources. Right, but frozen/dehydrated lose much of their Vit C. Unless you’re freeze drying any of these, any veggies you freeze/dehydrate your Vit C intake is much lower and cooking also unwinds the Vit C molecule – steaming/boiling. Fermenting- as in sauerkraut and pickles, preserves much of the vitamin C in foods, which is why it was such a popular preserving method in the old days. That specific area would become a forever wasteland. Chose a just slightly colder but nuke and earthquake free zone. Just something extra to consider if you are doing long term planning. Sounds like you have a plan worth copying thouh!! Samuel, nuclear reactors can be shut down quickly. It’s called SCRAM. And all reactors have backup generators for the purpose of cooling. The problem in Fukushima was they put the generatorsway to low in elevation and too close to the sea. They were washed out to sea on the first hit from the tsunami. That would not happen to the ones inland you are referring to. Could there be other problems? Perhaps, but not likely to the extent of total failure. The world learned a lot from the two big nuke accidents,thankfully! We live in the mountains of northern Georgia and it is a fabulous place to live! Rainfall per year here is 60″. Gardening is wonderful and I use my Greenhouse nearly yearlong. Just take a break in December and January. That’s why an vital prep is developing relationships within your community. In the event of EMP or other event that sends us back 100 yrs, there will be a lot of interdependence as people would barter for some of their needs. Small neighborhood communities can plan to produce sufficiently for themselves. Your assumption is that you would be totally on your own? That’s risky and would carry a high mortality probability. People need to band together for survival should S really HTF. I totally agree. The image of a lone household that doesn’t rely on any outside contact at all is only realistic in the short term. If there’s any chance of your children and their descendants having a life worth living, it lies in forming communities that can support each other. Inevitably that’s going to mean dealing with, integrating and maybe initially supporting people who weren’t prepared. A couple years ago me me and my sweetie were in the desert sitting beside the Rio Grande drinking cold beer when a couple of young men showed up on the Mexican side and harnessed a mule and horse together and started taking turns behind a plow turning a small field at the top of a low bluff. After a while one of them waded across the river to sit a spell with us. Said they were going to plant alfalfa for their stock. I’ve known a number of people over the years from south of the border who grew up in 19th century rural economies and learned that you shouldn’t expect your land to put the same food on the table you get at Trader Joe’s. Plant corn and beans, they’re easy to grow and store, let your chickens run free and live off bugs and keep a couple of yard pigs to eat snakes and chase the foxes. Goats are much less a luxury than beeves because they can feed and care for themselves. If you have a pond put geese on it, a small flock is ten times more security than you would get from a couple noisy dogs. And keep that corn fenced! You keep your geese. I’ll keep my noisy dogs who offer more companionship and innate abilities than your flying comforter stuffing……..
Water is the key to all survival. Even with good soil you need reliable rain or a spring or very deep dam for water. You can get close to sustainable, even with a small yard. Mine is 1/3 acre and I live in central Minnesota where temperatures can drop to -35 degrees F, and sometime even to -45. I did my research and planted just about every type of fruit tree and shrub that grows in this area, of course I chose dwarf trees. Plus, I have been planting many edible perennial plants (Jerusalem artichoke, rhubarb, etc.) and many wild edible plants. A book in wild edible for your area is essential, because they grow even in places like New York City and most people only see them as weeds, so competition for such a source of food is almost non-existent. I grow quite a bit of vegetables and will be increasing the amount because my next door neighbors doesn’t plan to use his vegetable garden and told me I could. (Neighbors yards may be a resource, if you do the work.) I also grow tropical plants which I move indoors. (limes, oranges, taro (the bulbs are one of the most important sources of food in tropical areas and most of Asia, some people know them as Elephant Ear, which are used for decoration in the yard, even the leaves are edible when young) and others. Right now I’m experimenting with starting potatoes in fabric containers, indoors, to shorten the season. They are doing really well and getting quite tall (some 4 feet). Once the snow melts, I will move them outside. YouTube has lots of videos for growing just about anything in containers. There are some thing that you will not be able to grow in a small yard, but you don’t need to grow everything, just what you like in quantities that will supplement what ever you have in storage. I don’t have chickens because they are not allowed but once my hazelnuts grow some more, no one will see into my yard. Bees and rabbits is something that I will add soon. I already have started planting some of the plants rabbits and chickens like. And because this is also a wildlife habitat, there are flowers year round for the bees. My son in law is one of the owners of a 4,000 acre corporate farm and I supply them with food, ironic. Well that didn’t work out like I planned. Concerning this topic, everyone needs to look up a video on YouTube entitled Award winning short film on how to be self sufficient Homesteading one small step towards freedom. They did it on one tenth of an acre. Quite amazing. If my memory serves me correctly, this family was featured on the show doomsday prepper. You can grow a lot of food on a small space. But even these folks say 80% summer, 50% winter….and no meat, grains for flour/meal, etc, and their biofuel is a product of restaurant oil. Shows them cooking in a wood fired oven, and they clearly don’t have a source of wood on that lot. SO….I call that semi-self sufficient….a worthy goal, without a doubt. But let’s get rid of the notion one can be self sufficient and live anything like modern man without the supply chain of the rest of the world. SOOO how do they do this? They don’t. At least not in any way that would qualify under the author’s tremendously flexible definition of (self-sufficient). Soybeans will yield about 280 lbs per 0.10 acre. With the efficiency of care and attention paid to just one-tenth acre (or even an acre or more) as opposed to much larger-scale operations, those yields could be dramatically increased. But, even doubling ypa would give about 1/4 ton per 1/10 acre … not the 3+ tons claimed above. The best option for yield per acre is apple trees (oops, nature beat “the Urban Homestead” to the punch on “vertical farming” practices). Two or three (mature) apple trees can be grown on 1/10 acre and yield 1,500 lbs of apples per tree. But, as they say, the best time to plant an apple tree is 20 years ago. If you’ve got ’em; take care of ’em! Otherwise, keep in mind that the 260+ lbs of wheat will bake you a loaf of bread per week, if not two per week. It ain’t “self-sufficient” by a long-shot, but it’s not bad. And it’s better than the imaginary yield of utterly NON-self-sufficient vertical hydroponics, and cheaper and easier to boot. 20+yrs of conditioning soil, adding growing structures, intensive gardening and from what I could see father and three kids totally dedicated to cultivating, harvesting, planting. 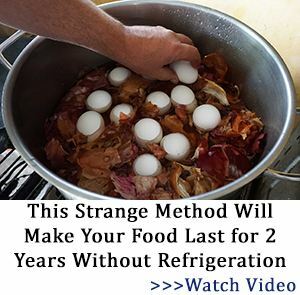 this is not something a prepper or homesteader could jump into. Clearly the 20+ years of effort is paying off. They said in the video, they made $20k a year. That is a long way from $65 profit. Granted, they are not going to tell the Government how much they really make. Can you recommend a book for local edible plants? Studhauler, I never got your message for some unknown reason. Unfortunately my town does not allow any “farm” animals including rabbits, chicken or even bee. I’ve been planting to cover my entire yard and some day I will have them since no one will be able to see them. As to the books I have: Abundantly Wild by Teresa Marrone (even has some recipes); Field Guide to Edible Wild Plants by Bradford Angier; The Forager’s Harvest by Samuel Thayer and Backyard Medicine by J Bruton-Seal and Matthew Seal which explains how to use plants for herbal medicines. They also work for areas of Canada since they are next to Minnesota. A: Enough to put out the bait for the deer. I am still working on getting our 1/2 acre up to full capacity. You can get by with an unheated greenhouse by using it to grow vegetables that are cold hardy to begin with- the greenhouse just helps them along during the really cold part of the winter. Things like chicories and endives, radishes (don’t forget that the leaves are edible too!) kale, perhaps broccoli? any excess greens will be happily eaten by your animals too. Also, even if you don’t have room for most animals- you can get a lot of protein out of chickens in the form of eggs as well as the occasional rooster- no need to use up precious space for larger animals. The key to chickens though, is to get a breed that still knows how sit on eggs and raise babies. A lot of them have had that bred out of them. The old rule of thumb for a family of four in the South was 40 acres. The saying was “Forty acres and a mule”. That was supposed to be the 19th century formula for a self-sufficient farm. Even so, produce had to be traded for items. Manufacturing your own gunpowder for your shotgun or muzzle loading rifle was not possible unless you had a source on your property for saltpeter and sulfur. One could manufacture buttons from bone from your animals or wild animals, but it was tedious work. Footwear could be fashioned from your farm, but it would take skill in leather working to accomplish. Much easier to trade farm produce for shoes. One could burn corn oil in lamps, but buying lamp oil produced a better flame, more light and less smoke. One had to trade for lamp oil and for the lamps in which to burn it. Unless one is going to live a brutish existence, trade and barter is necessary. That means one must eventually depend on others in order to live. Even the Indians traded with other tribes for desired items and they lived in villages where they had each other for support. John Jeavon wrote a book titled How to grow more food on less land than you ever thought possible This is the first book that tells you how to grow food his way and there is another book that that states that you can grow enough food on 9 100 sq ft beads It also tells what foods to grow and how many for a complete diet. About raising meat, the author Jonathan Hollerman points out that a single lb of rabbit meat requires 1.5 lb of feed to produce. One lb of beef meat requires 6 lbs of feed to produce. It is much more efficient to raise rabbits than beef cattle, in spite of how much I love a good steak. It just makes more sense if you are trying to scrape out a self-sufficient homestead on minimal acres. In addition to those economies, there’s less waste, unless you are going to can all that beef, make jerky, give it away, etc. (Assuming you don’t want to count on electricity and freezers) With rabbit, you can plan exactly how much you need for dinner. And, of course, they multiply like … well … rabbits. I love this and other website. I enjoy reading everyone’s comments. Free speech should be a Constitutional Right, Opps! With so many types of agricultural land to work there will of course be many variations to consider. Yes, one acre will contain a cow but it won’t sustain it. You will need supplemental hay, alfalfa and perhaps grains if you chose to grain feed your cow. If you chose to raise a hog or two they need less space but better fences. Doing as much for yourself as you can is always wise but if you have a couple neighbors doing a similar acreage then if one or two of you specialize in a couple different things then you can grow in bulk and trade amongst each other but all should maintain a diverse farm. Heating, with modern technology we can better insulate, incorporate solar and wind power for reduced power consumption. I think all Americans would benefit by doing more with what land you have, saving your hard earned money and reclaiming our Constitutional Freedoms. Good luck to everyone!